At the season’s end of our last farmer’s market, I decided to load up on a variety of squash. I’ll admit that I am not too big of a squash lover, but I did it for my wife, as she is the one that likes them. But as I stared at the delicata and butternut squash, I decided I would roast both of them. That’s when the idea came into play, probably because I was searching for ideas for dinner and something everyone would love and agree on, and that’s when I thought of lasagna. Lasagna with a twist that is. Who doesn’t love a great dish of lasagna? What no one knew is that I had a good couple of cups of that delish, roasted squash, and ever better I did not tell them until after they devoured a couple of slices. Yep, that’s where my kids are now, two slices, and eating me out of the house. Preheat your oven to 375 degrees. Add the squashes to a baking sheet, and cook flesh side up for about 45 minutes, or until fork tender. Once the squash is cooked, scrape out, and mix into a bowl. You will only need about two cups, but feel free to use more or less based on your preference. Start by cooking both of your meats. Feel free to combine these in a large skillet. Break apart the meat as it is cooking to prevent large clumps. Strain the meat mixture, removing the fat, then return the meat back on the stove on medium heat. Add a pinch of salt, some cracked black pepper, the red chili flakes, and the garlic powder. Give a good stir, cooking for a minute or two, then add in your sauce. Stir, and let this reduce down a bit, cooking for about 10 minutes. To another mixing bowl, add the egg, ricotta cheese, the squash, Italian seasoning, salt, pepper, and half of the parmesan cheese. Give that a good mix so that the squash is fully incorporated into the cheeses. Now let’s get to this lasagna. Take a good ladle of your meat sauce, and add to the bottom of your lasagna dish. Add the lasagna sheets. Mine fit three to the pan. Next, be generous and add enough of the ricotta and squash mixture to cover the pasta sheets. Lightly sprinkle on mozzarella cheese, then more meat mixture, pasta cheese, more ricotta mixture, more cheese, more sauce, then remaining pasta sheets. Cover with meat sauce, the cover with cheese. Shower with the remaining parmesan cheese. Spray the back of some aluminum foil with some cooking spray. I’ve found this to prevent all of that wonderful cheese from sticking onto the foil when removing from the oven. Cover the baking dish, and place into a 375 degree oven, cooking for 30 minutes. After 30 minutes, remove the foil, and continue to cook for about 20 more minutes or until the cheese is nice and golden. Let cool for about 10 minutes before slicing into squares. The end result was everything that is wonderful about a great lasagna, but there was that bit of hidden sweetness from the blended squash that made this one even better. After the kids were finished eating (as well as my wife), I said “So how did everyone like the squash?”. They had confused looks on their face, but all replied that they had no clue it was in there, and loved every bite. What’s not to love about that? Gotta get the good stuff in there somehow, I was successful on that front. Hope you enjoy! 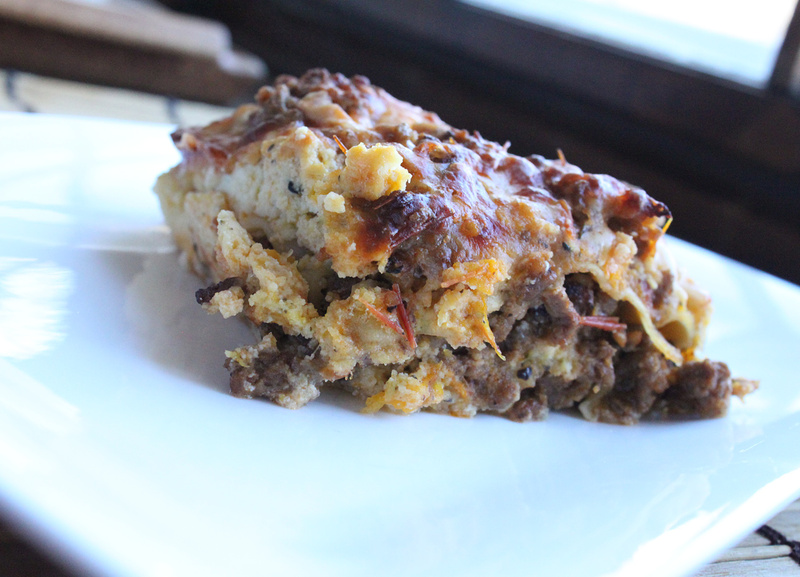 I am a big lasagna fan & this recipe surely gives me another reason to love it even more! Thank you so much!